Former Italian Premier Silvio Berlusconi was charged with false accounting, embezzlement and tax fraud Friday in connection with his media empire's purchases of TV broadcast rights for U.S. movies, his lawyer said. Berlusconi's close friend and former British lawyer, David Mills, and the chairman of his Mediaset conglomerate, Fedele Confalonieri, also were indicted in the preliminary hearing, Berlusconi lawyer Nicolo Ghedini said. Nine other people face charges including tax fraud and embezzlement, Italian news agencies reported. All the defendants, who were ordered to stand trial starting Nov. 21, have denied wrongdoing. Prosecutors allege that Mediaset purchased TV rights for U.S. movies before 1999 through two offshore companies, and made false declarations of the costs to lower the tax bill. 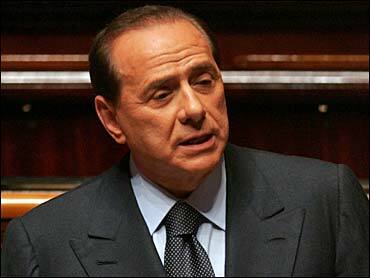 Berlusconi, Italy's richest man and longest-serving postwar leader, lost the premiership in April elections. He has a long history of legal troubles linked to Milan-based business interests. To date, every case has ended either with his acquittal or a dismissal of charges because the statute of limitations expired. He has always maintained his innocence. Ghedini complained that the judge did not permit the defense to present witnesses at the hearing who could have demonstrated that Berlusconi was not involved in the events in question. "As always in Milan there has been an indictment that there should not have been. They (judges) didn't allow us to hear witnesses," on Friday, Ghedini said. "We are convinced that Berlusconi will be absolved, and we are calm." Berlusconi's three Mediaset networks are the main private TV rivals to Italy's three public channels. Berlusconi's defense had argued to have the proceedings moved to another city because more than 60 judges in Milan are or have been shareholders in Mediaset. The motion was denied. Separately, Berlusconi has been accused of ordering the 1997 payment of at least $600,000 to Mills in exchange for the lawyer's false testimony in the Mediaset TV rights case and another proceeding. Mills is accused of failing to tell a court that the offshore companies involved in buying U.S. film rights were linked to Berlusconi. He told Sky News in London that he was baffled by the new charges Friday. "As far as I can understand, the judge has acquitted me of being involved in any tax fraud in Italy in respect of the years when I acted for Mr. Berlusconi's companies, but wants me to stand trial for two years, 1999 and 2000, after I had stopped acting for the company," Mills said.